Arvada Towing Service is the first choice for full-service towing needs in the city of Arvada and surrounding areas, including Wheat Ridge, Lakewood, Westminster, Thornton, Northglenn, and Broomfield. We work hard to be thought of as different than your usual towing service. Most people have a rather typical image in their mind when they think about a wrecker service company. Our dedication to customer service and the polite and professional manner of all our employees will quickly change that image. Before they ever put a foot on the gas pedal of our trucks, all our employees are deeply trained and instructed in how we want them to treat our customers. We have a zero-tolerance policy when it comes to rudeness or discourtesy. And also when it comes to things like drugs; all our employees are routinely drug-screened for the safety of our customers. We are not one of those companies that are content to hire drivers who possess a license and a pulse. We take the time to teach and educate. Our employees need to understand why they must not pass off a bad day or a bad mood onto the customer. When they are in our trucks they are representing our company. We respect them, and we expect them to respect our customers. All of our equipment is top quality, and it is always clean and well-maintained. That’s because we believe the quality of a company’s tools is important to the job; in many instances you can only do as well as your tools allow. Because we keep up with the latest technological advances in our field we can often work safer and faster. The customer will always benefit from the savings we pass on to them. This is how we can be so affordable. We are not the cheapest tow truck service in the area but we also don’t cut corners--ever. We just work smarter, not harder. Obviously, the bulk of our services are towing related. But we also place a very high priority on roadside assistance. We will radio-dispatch trucks out to stranded motorists as quickly as possible. Our employees have been educated to understand that their job is much more than just unlocking doors and fixing flats. The customer is likely going to be highly stressed and maybe even in a state of panic depending on the situation. A few kind and reassuring words will go a long way for a motorist who has just had a tire blow out on him, or an engine seize up on him, or maybe has been in a traffic accident. The compassion our drivers show is one thing that makes our company different. If you have any questions or need more information or just want to get to know us better, please fill out the form located on any page. We will reply as quickly as we can. 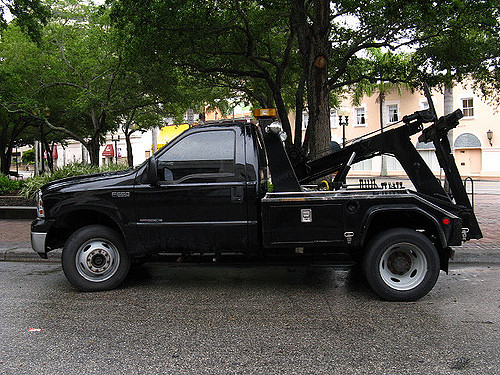 It’s important for you to have on your person the number of a tow truck service in the Arvada area that you know you can trust and depend on. We look forward to hearing from you.